Newcastle striker Craig Bellamy has joined Scottish giants Celtic on loan until the end of the season. The Welshman, who fell out with Magpies manager Graeme Souness over his exclusion for a game against Arsenal, rejected a proposed move to Birmingham. And although Celtic could not match Birmingham's £6m offer for the player, Newcastle agreed to a loan deal. Bellamy, 25, will now link up with Wales international team-mate John Hartson in a revamped Celtic attack. Also familiar for the striker will be boss Martin O'Neill who was manager of Norwich when Bellamy was at the club as a youngster. Bellamy told BBC Radio Five Live: "I knew this club was right for me as soon as I heard they were interested. "This is a big thing for me, to come and play for an incredible manager and be part of Celtic football club is a great honour." However, Bellamy revealed his torment at having to move from Newcastle. He added: "I'm still emotionally attached to Newcastle. I didn't really want to leave and the way it has happened, I have found it very difficult. "I do love the club and I am still coming to terms with life without Newcastle." O'Neill seems very aware of the need for patience. He said: "If Craig clears his head, which he needs time to do. If he is absolutely ok, he'll be brilliant. And he delivered a hint at the way he intends to handle Bellamy, when he recalled their crossed paths at Norwich. He joked: "I think he was about 12 at the time. I just missed him at the door one day, he was demanding to be in the first team then. "But I am absolutely delighted and really excited he is here. "At this minute there is a lot of excitement in the dressing room as well. I say this minute, because the players will soon get to know what he is like. He added: "I'm absolutely ecstatic to have signed Craig. We do have an option to sign him on a more permanent basis at the end of the season." "He has that reputation, no doubt about it, but we'll have to take that on, but I'm sure if he scores a few goals nobody will talk about that. "There are one or two big players here - and I don't mean bigger than Craig physically because most people are - but lads who can give it out as well. "So he won't have it all his own in the dressing room." 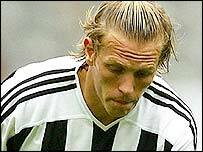 Bellamy was fined two weeks' wages by Newcastle after a live TV interview in which he accused Souness of lying, following a public dispute about what position he should play in the side. Souness said: "He can't play for me ever again. He has been a disruptive influence from the minute I walked into this club. "He can't go on television and accuse me of telling lies." Chairman Freddy Shepherd described Bellamy's behaviour as "totally unacceptable and totally unprofessional".